Raku Decorative Bowl, hand carved. Not food safe. A Copper Red glaze with some irridescent highlights. $120 US. Raku Decorative Bowl, hand carved. Not food safe. Glossy Red glaze with gold dots. Black grooves. $120 US. Raku Decorative Bowl, hand carved. Not food safe. 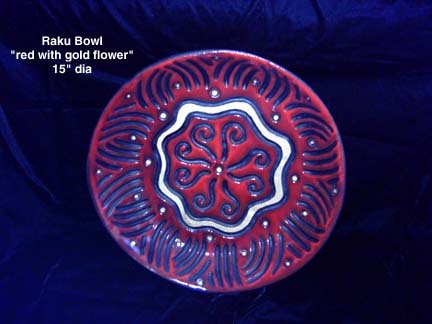 Glossy Red glaze with gold "floral" design. Black grooves. $120 US. Stoneware Bowl, hand carved. Food Safe in glaze area only. Grass design. Oatmeal highlights over brick red stoneware. $80 US. 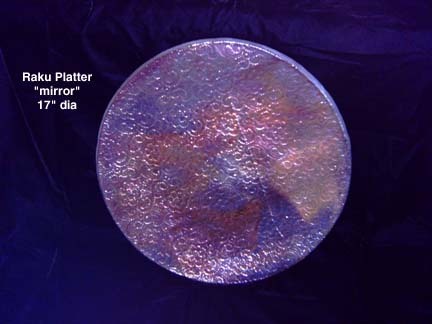 Raku Decorative Wall Platter, lace imprint. Not food safe. My own "Krome" glaze with obvious copper red irridescent highlights. Colors change with angle of viewing. $110 US. 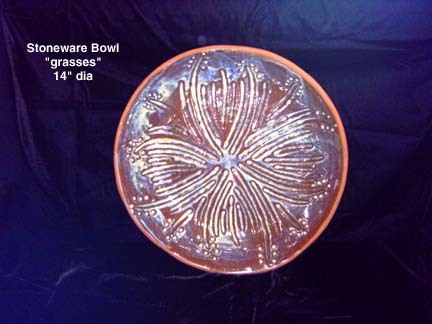 Raku Decorative Wall Platter, lace imprint. Not food safe. My own "Krome" glaze with slight copper red irridescent highlights. Colors change with angle of viewing. $110 US. 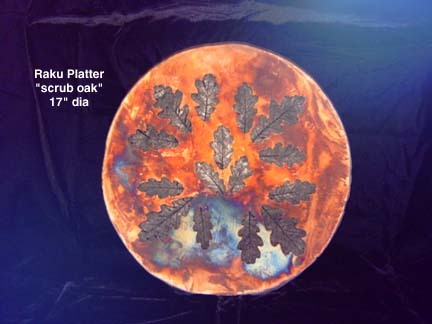 Raku Decorative Wall Platter, Scrub oak leaf impressions. Not food safe. 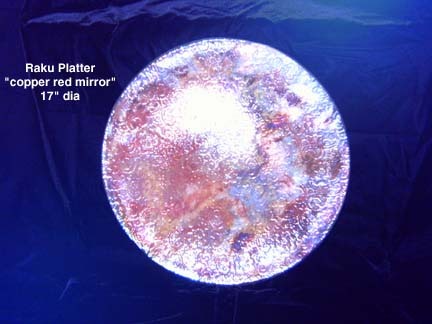 Dry Copper glaze with irridescent blue flash at bottom. $100 US. 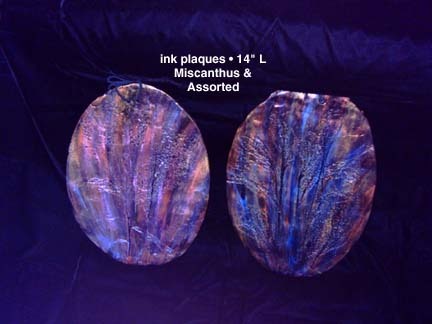 Raku pieces are normally ornamental and not functional in nature. 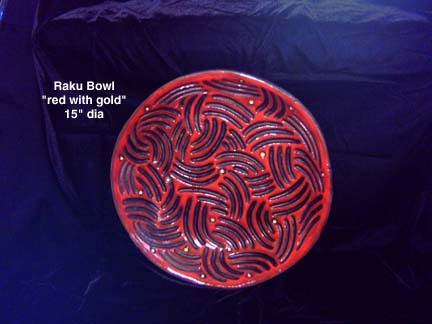 Raku is not recommended to hold liquid (it could crack and/or leak). You could place a watertight container inside the Raku piece if desired to use as a vase or planting pot. Raku is NOT food safe. If this is a garden or outdoor decorative piece, it is recommended to keep this Raku piece from direct sun and rain exposure (protected porch or alcove). 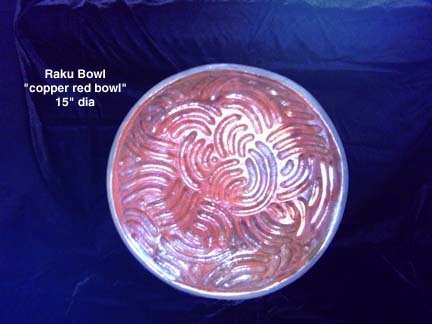 You will need to bring your Raku piece inside to prevent winter "freeze/thaw/freeze/thaw" damage. 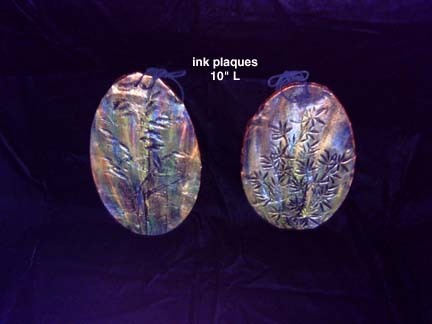 If your piece has glossy gold markings, keep it from direct window/sun exposure to prevent fading. If your raku piece has handles, they are decorative only. Do not lift it by the handles due to the fact it is of a low-fire process and not as strong as a high-fire ware. Raku Pieces are characteristically black with metallic or crackle glazes. This firing technique originated in the Orient over 400 years ago. The Japanese Raku technique differs slightly from our American Raku technique. Once a pot has been bisque-fired for stability, it is painted with the desired Raku glazes. It is quickly heated in a combustion-fueled (usually gas) kiln. At 1850 degrees, when the piece glows red hot and the glazes look wet, it is removed and plunged into a "reduction chamber." This can be a pit of sand or dirt with a lid, or a metal container with a lid (metal trash cans work well). The reduction chamber is lined with combustible materials (pine needles, newspapers, sawdust, dried leaves, grasses, etc) -- different materials cause different effects. After a short initial flaming caused by plunging the red hot pot into the chamber, the lid is clamped on to effectively cut off the oxygen source. Fire requires oxygen as fuel. The flames seek oxygen to live, but because the lid is on the chamber, oxygen must be robbed from the spaces between the burning material as well as that in the pots and the glazes. This is what pulls the coloring out of the glazes. The black on the pots is simply the carbon created by the burning process in the combustible material. Raku is largely an incidental process, so each piece differs as the colorings are (with luck) a matter of the flame and the oxygen being in just the right place at the right instant. The Raku process provides a unique non-reproducible piece every time. "Impression" denotes actual plants imbedded into clay surface. "Design" is stamped or carved as noted. All designs are black and copper with gold highlights. Other colors noted in description. All plaques labeled on back with plant names (common and botanical). 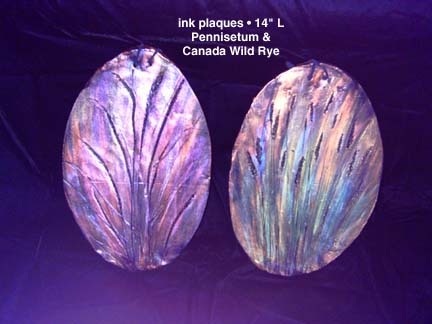 Inks on ceramic ornamental grass designs. Left is Northern Sea Oats impression in greens/blue. Right is Bamboo (stamped) design in greens/blue. $20 US each. Inks on ceramic ornamental grass impressions. Left is Purple Fountain Grass in pinks/lavender. Right is Canada Wild Rye in greens/blue. $30 US each. Inks on ceramic ornamental grass impressions. Left is assorted with Miscanthus, Panicum and Northern Sea Oats in pinks. Right is Miscanthus in blues. $30 US each.